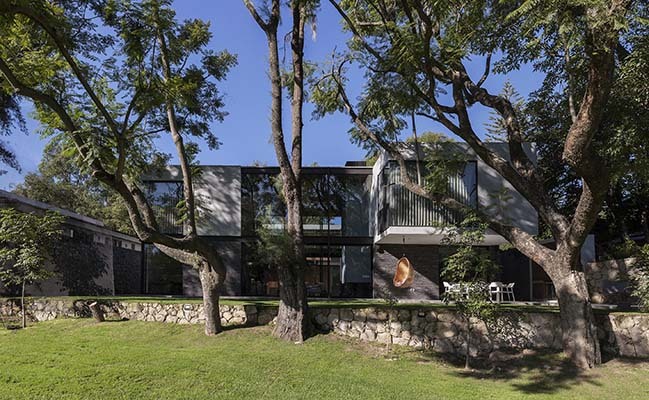 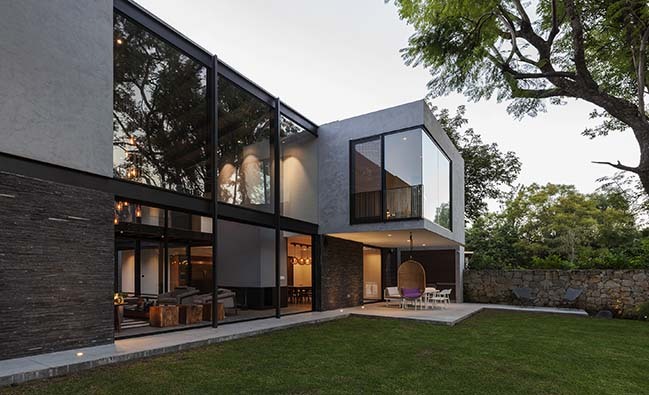 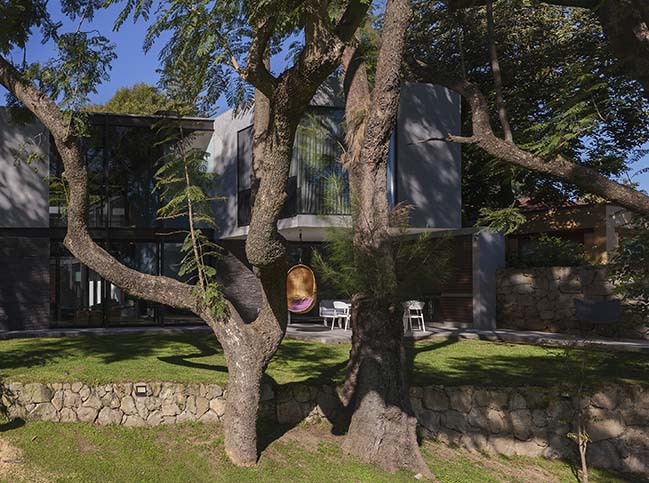 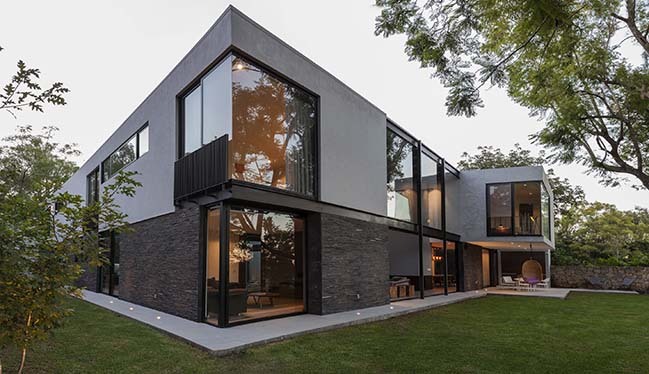 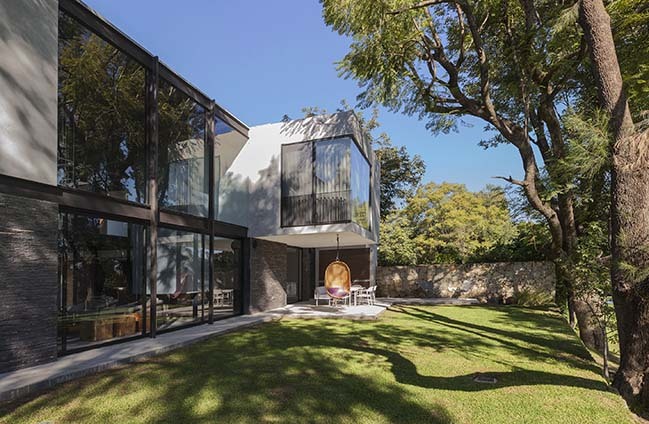 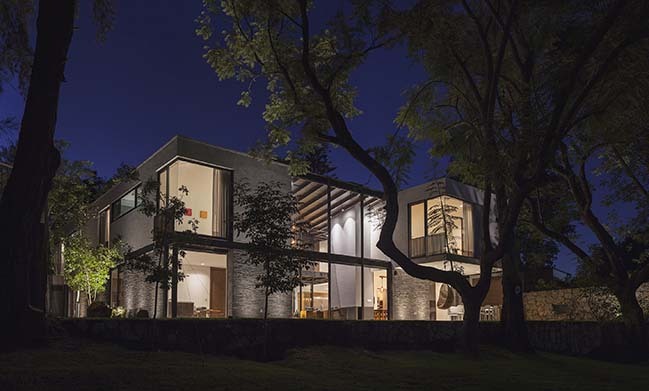 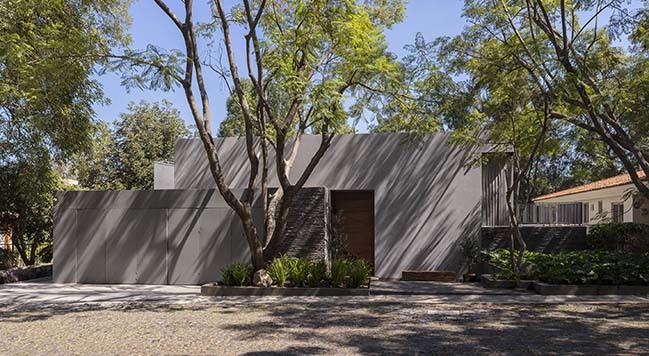 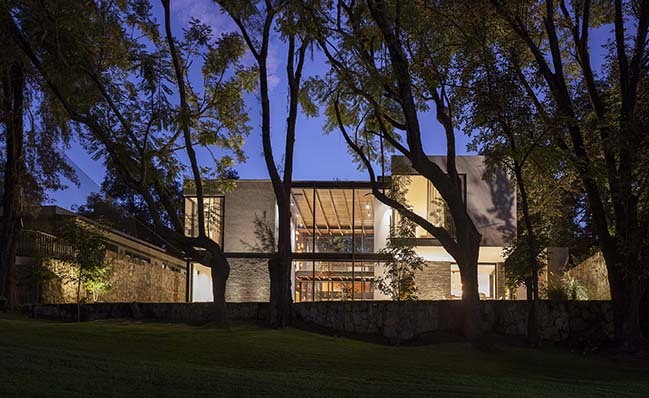 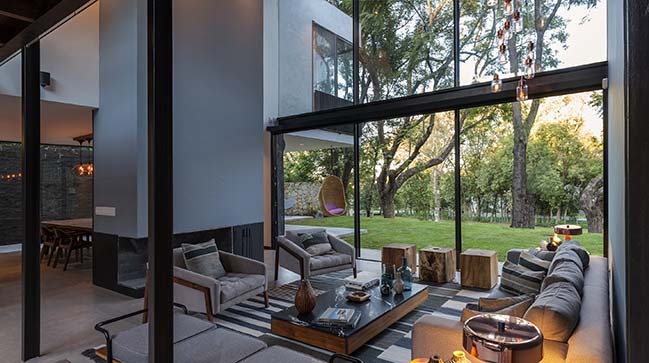 The house is located on the western side of Guadalajara, Jalisco, in a private housing development overlooking a forest that delimits a golf course. 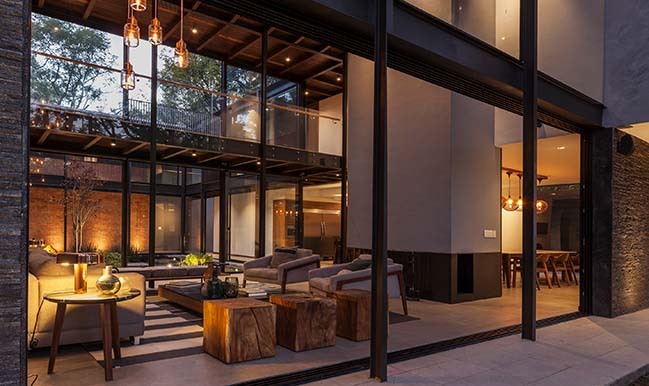 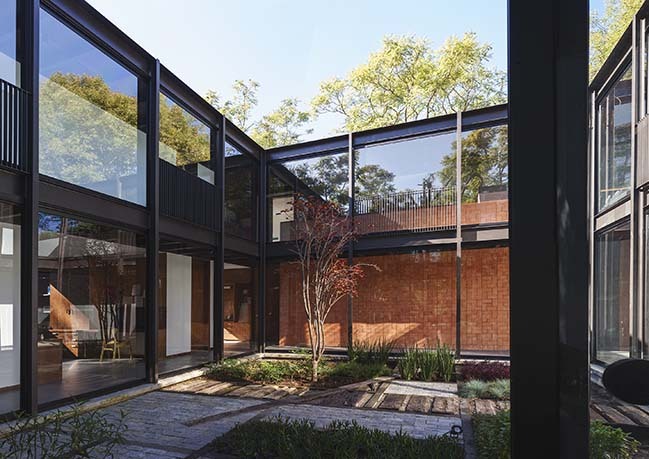 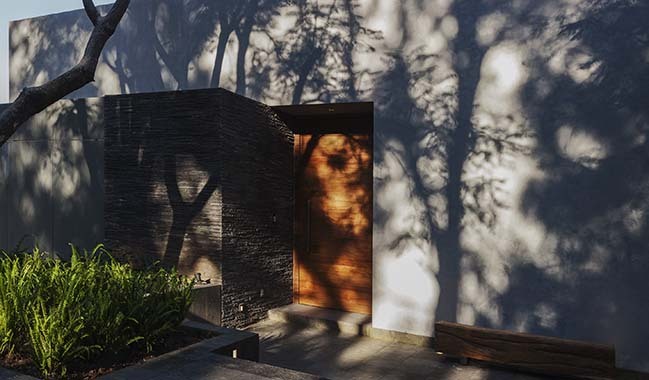 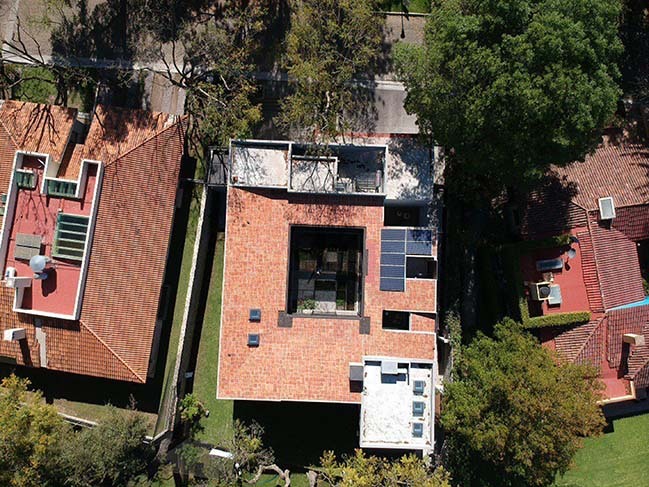 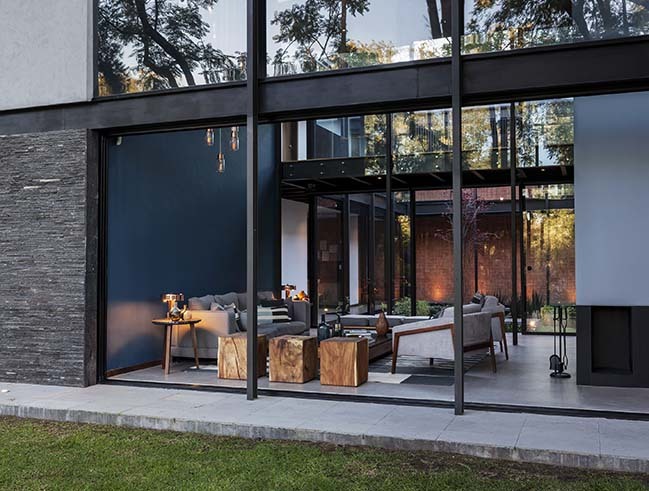 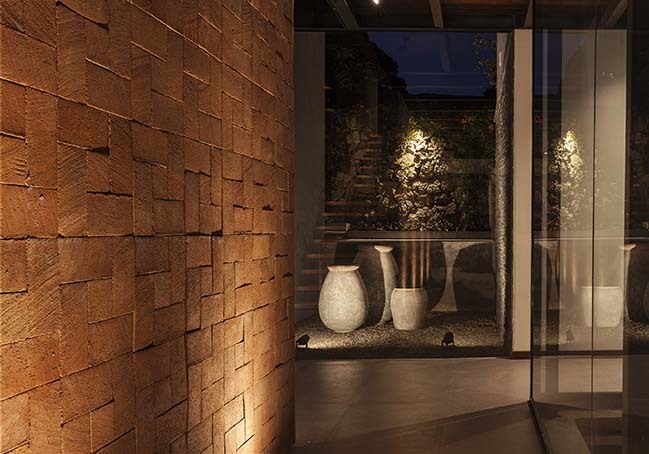 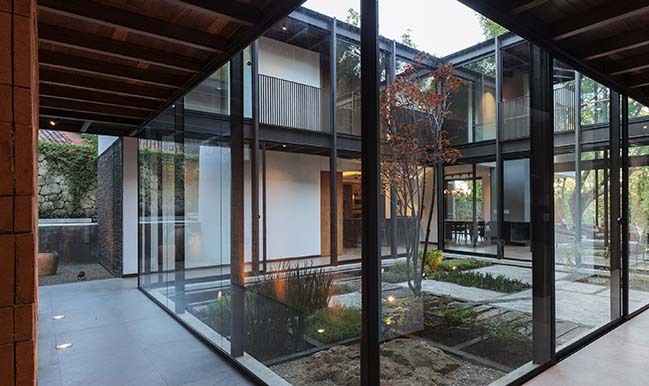 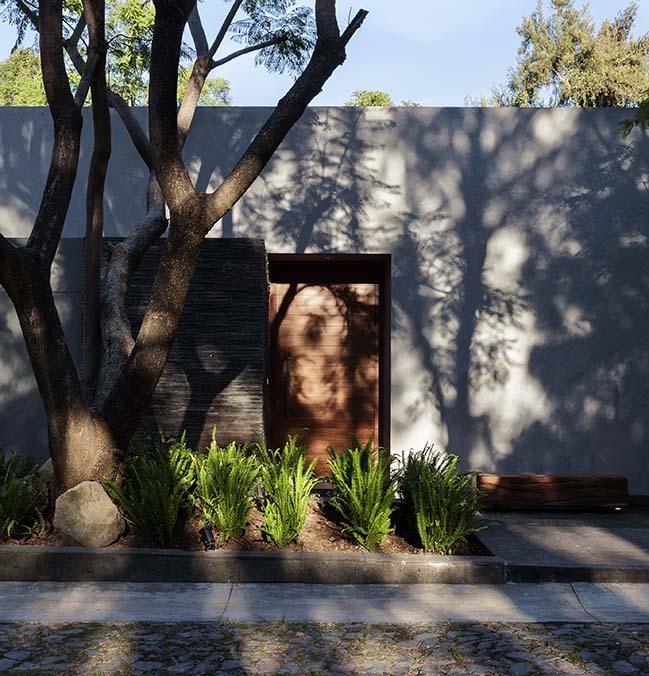 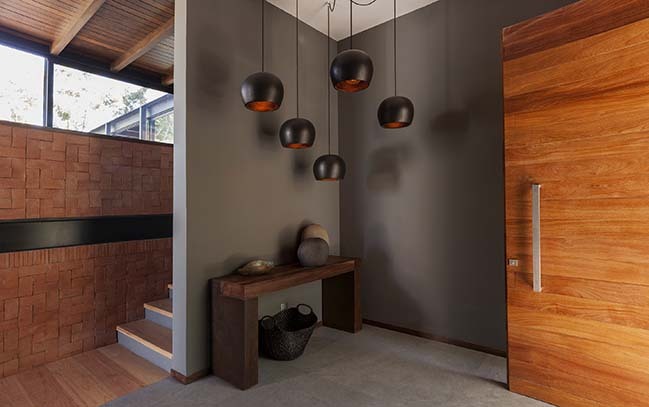 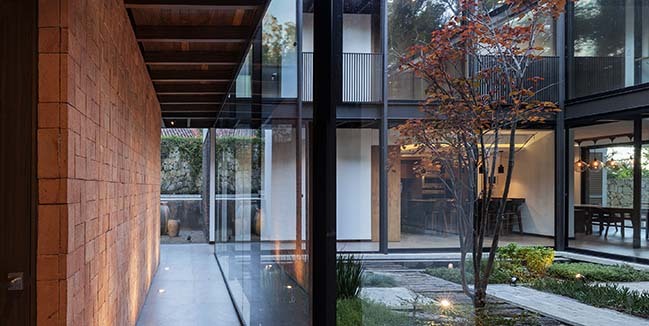 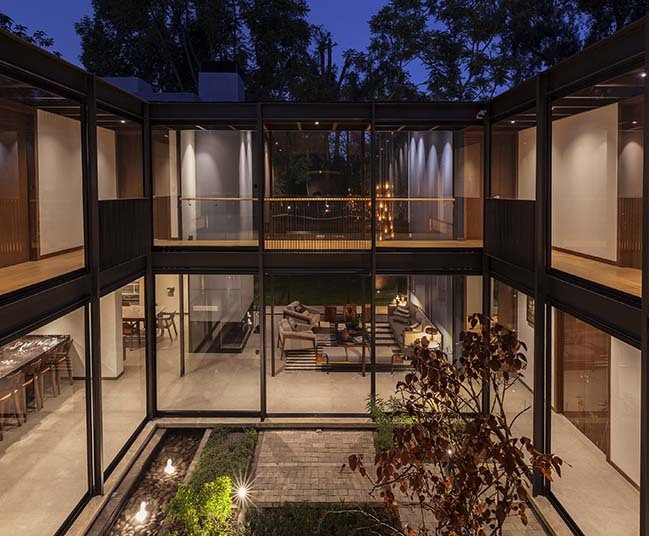 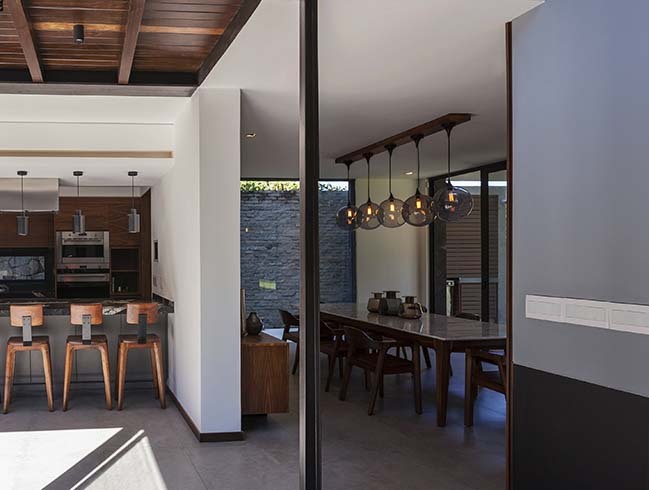 From the architect: The concept of the project originates from the reinterpretation of traditional Mexican homes, where public and private spaces revolve around a central courtyard. 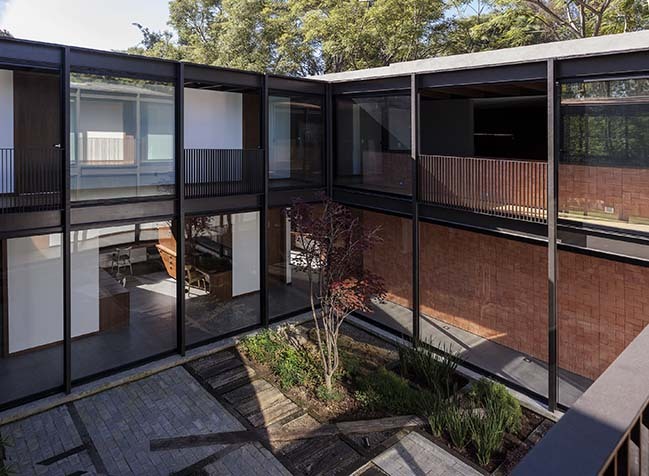 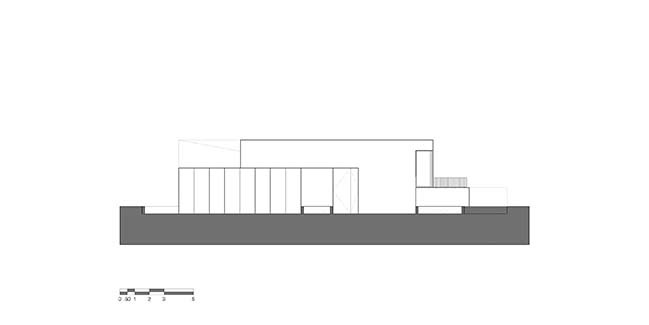 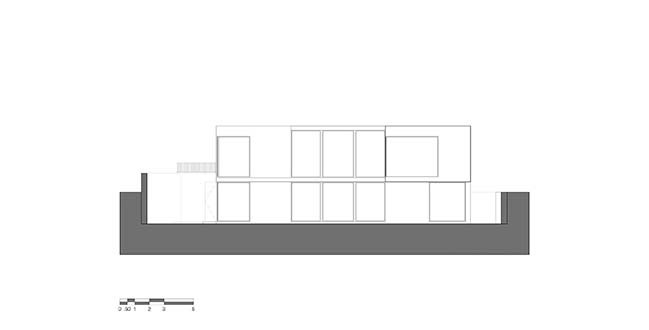 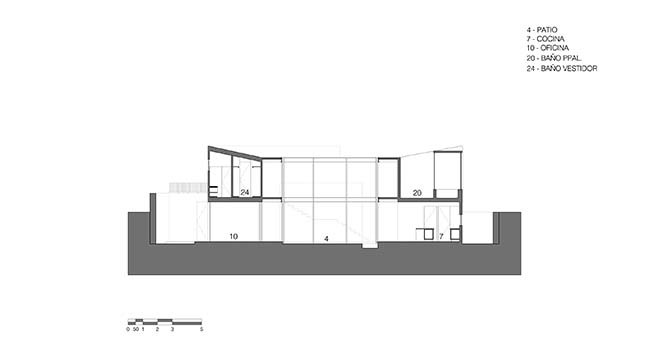 The façade towards the street is composed of two solid volumes that generate the entrance at its intersection. 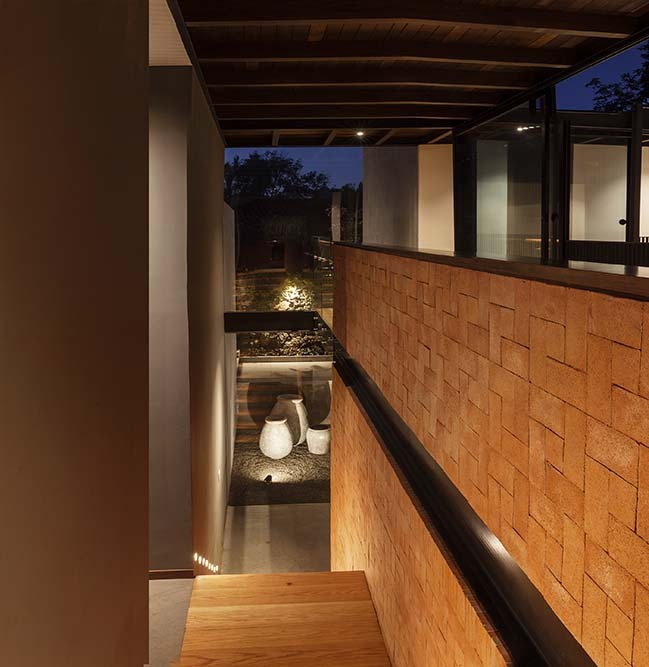 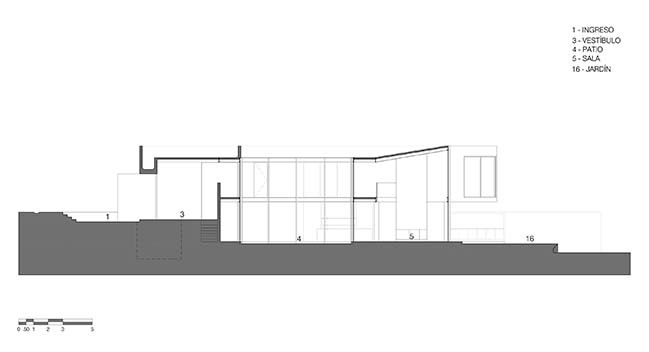 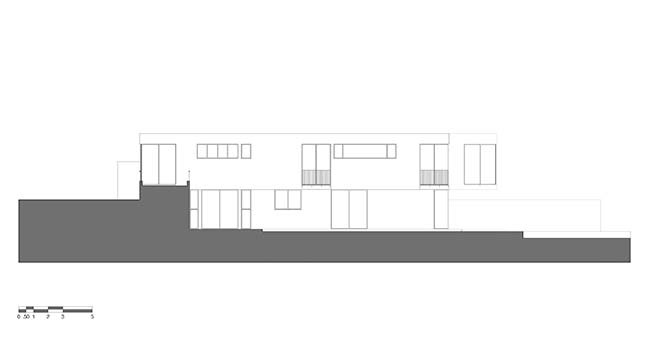 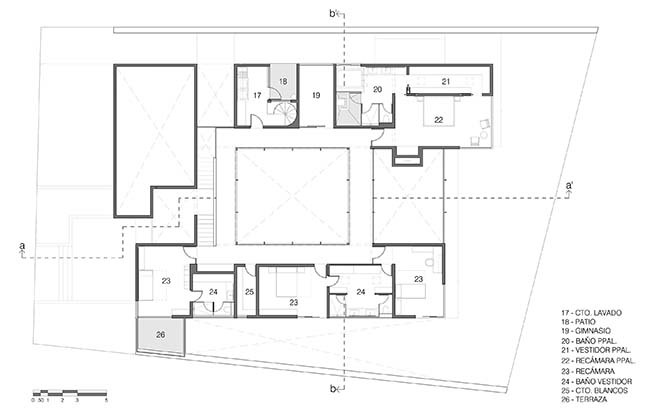 The access to the house is through a terrace that is one meter below street level, from where one enters a lobby that leads to the staircase that connects the upper floor, where the bedrooms are, and the ground floor where the social areas are. 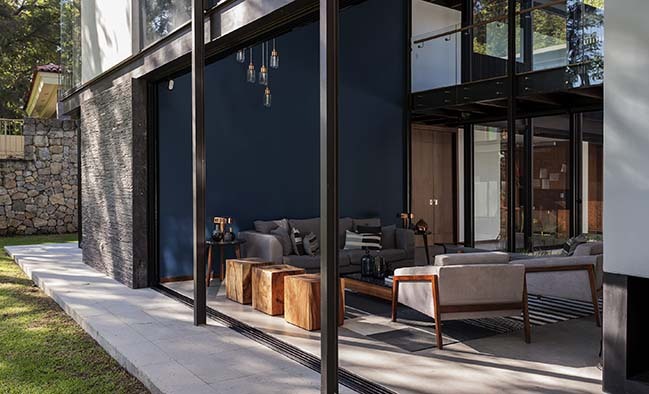 The ground floor of the project is half a level below the street level and half a level above the level of the golf course to which the property opens. 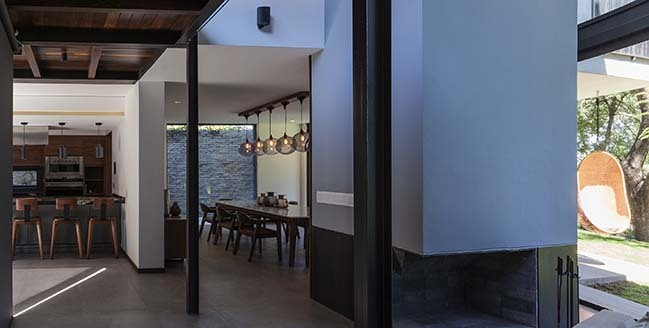 The work studios, family room, living room, dining room and the kitchen are on this level, organized around the central patio with an internal corridor. 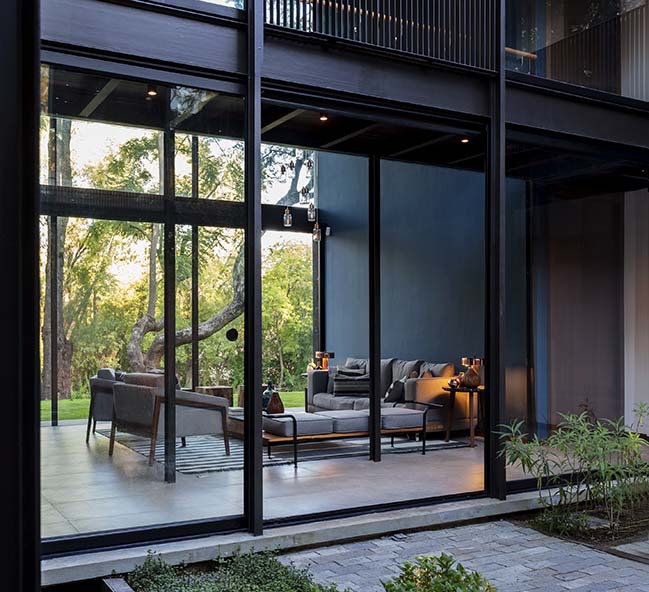 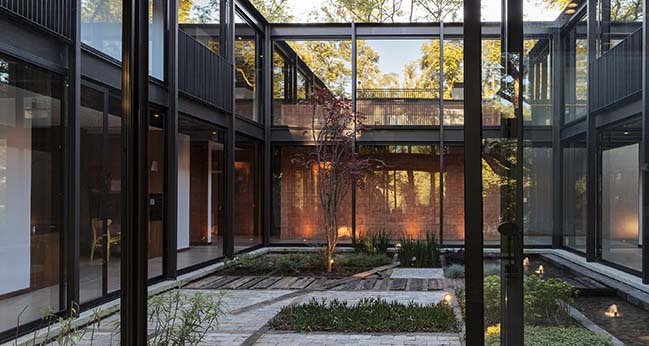 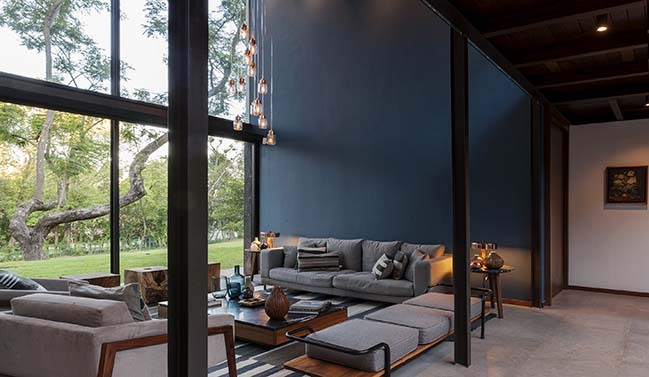 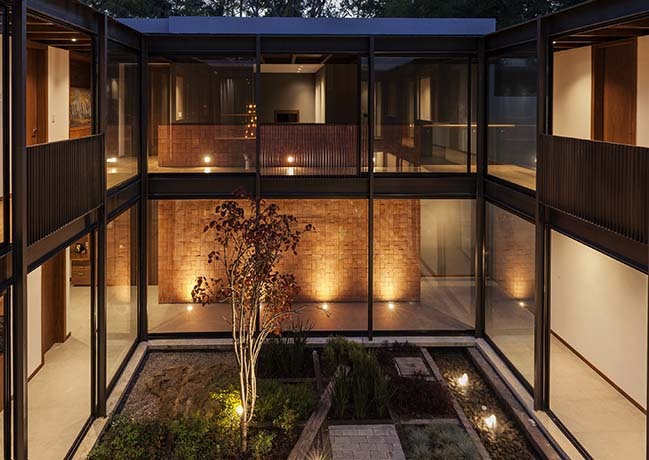 This patio visually connects all the spaces and provides an inner landscape for the residence. 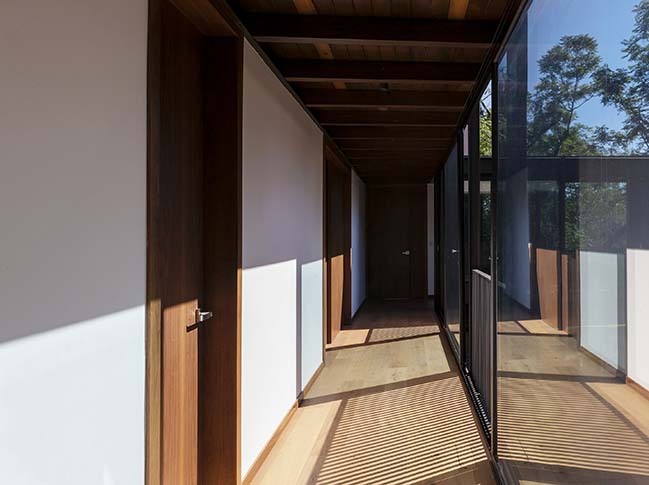 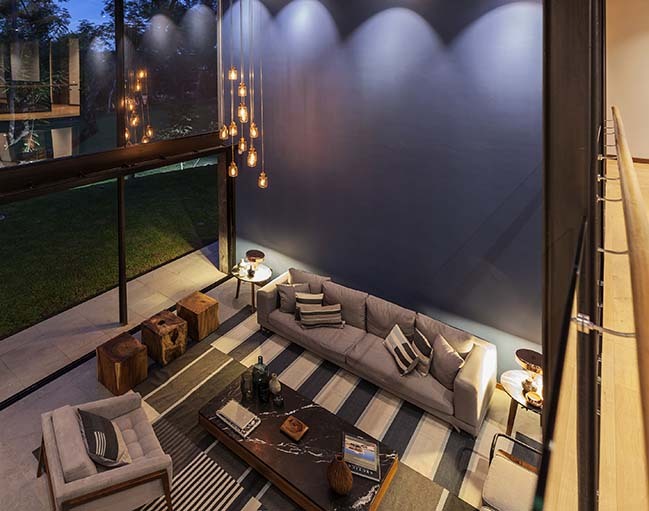 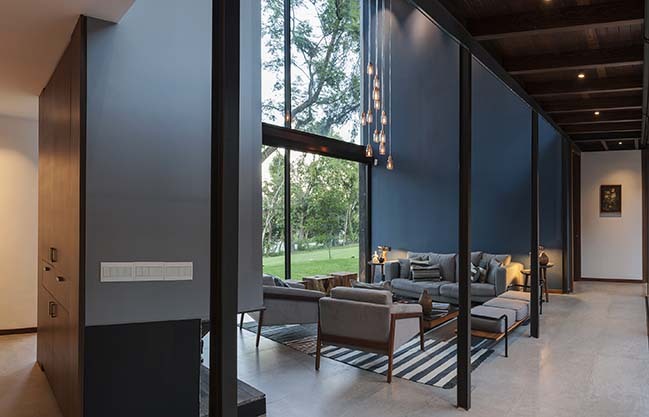 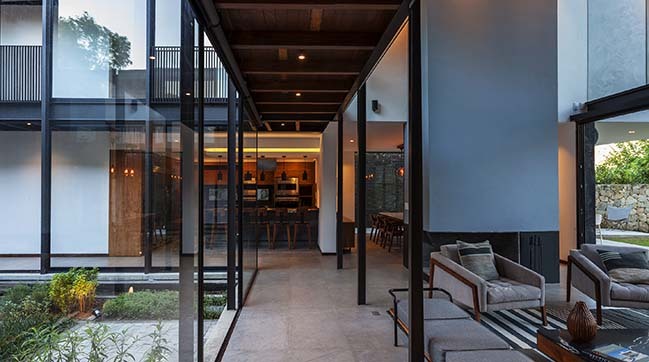 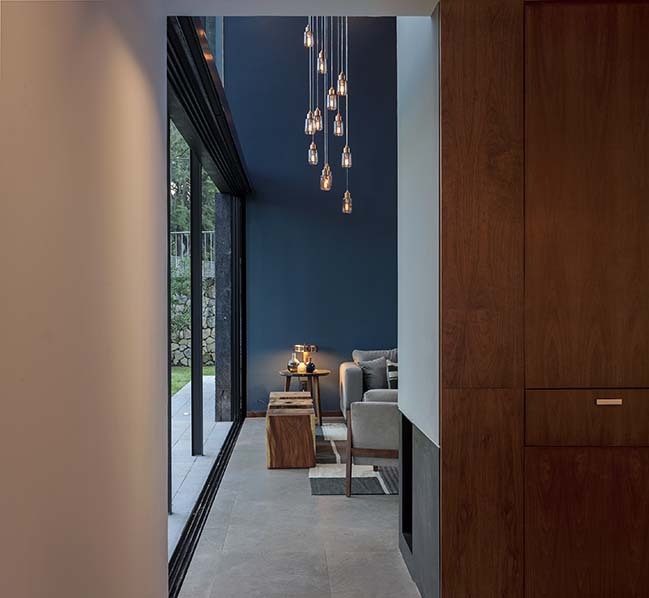 The living room is located at the center of the project in a double-height space through which the forest on the outside permeates into the interior of the house. 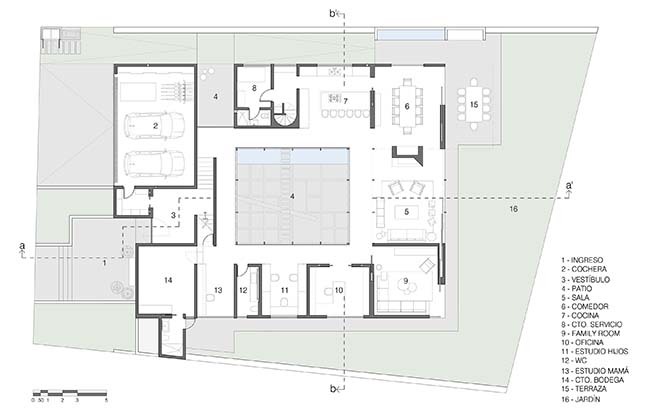 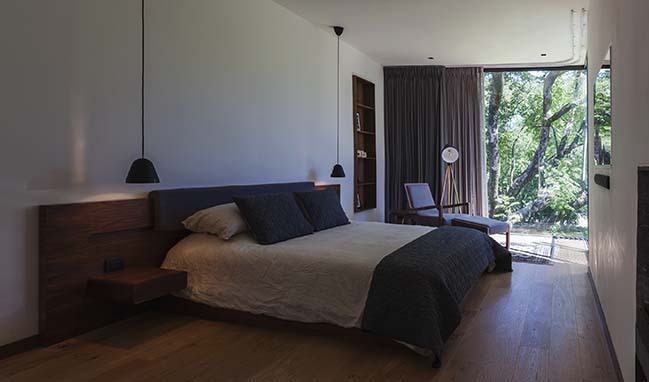 The double height is crossed by a bridge that connects the bedrooms of the children on the top floor with the master bedroom and gym. 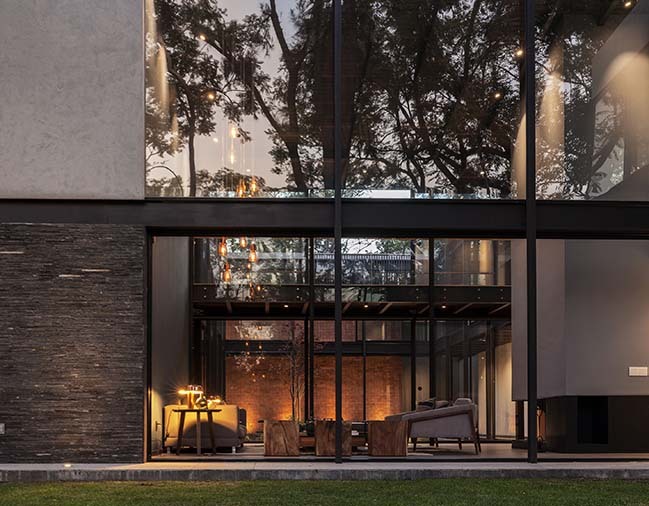 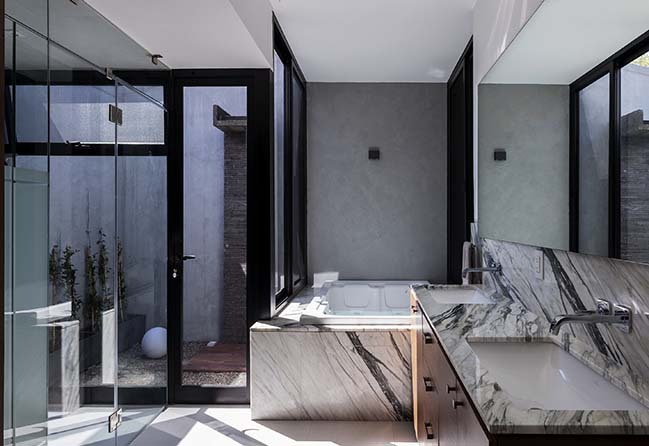 The shape of the project that faces towards the forest is composed by a stone base, over which the volume of the master bedroom projects in cantilever, and the double height window of the living room that divides it.